Selected the by Washington Wizards in the second round (46th overall pick) in the 2014 NBA Draft ... Traded on draft night to the Los Angeles Lakers ... Signed with the Lakers on August 25, 2014. 2015-16: Averaged 15.5 points, 4.0 rebounds, 2.4 assists, 1.11 steals and 0.09 blocks in 32.3 minutes over 79 games (79 starts) … Scored 20+ points on 20 occasions, including 30+ once … Posted one double-double … One of 10 American rookie and sophomore players selected by the league’s assistant coaches to participate in the Rising Stars Challenge at NBA All-Star 2016, starting the game at shooting guard and finishing with 25 points, five rebounds, five assists, and four steals in 23:40 … Also participated in the 2016 Taco Bell® Skills Challenge, joining Kobe Bryant (2007) and Derek Fisher (2004) as Lakers who have participated in the Skills Challenge event … Scored in double-figures in a career-best 27 consecutive games, beginning 12/30 and stretching to 2/24 … Scored 20+ points 20 times … Led the Lakers in scoring 16 times (two ties) … Drilled a career-high six three-pointers en route to 28 points 2/24 at MEM … Tallied a career-high 10 rebounds en route to his third career double-double (22 points) 11/29 vs. IND … Scored 19 points with four steals 11/28 at POR … Tied a career-high with 30 points (12 FGM) 11/3 vs. DEN … From 2/10-2/21, netted 20+ points in three consecutive games, the longest such streak of his career … Had third straight game with 20+ points, scoring 20 points with nine rebounds and four assists 2/21 at CHI … Totaled 20 points and six assists 2/19 vs. SAS … Recorded 22 points, six rebounds and seven assists 2/10 at CLE … Notched 21 points, four rebounds and three steals 11/13 at DAL … Tallied 24 points (10-15 FG) 12/30 at BOS … Had 23 points with five rebounds 1/5 vs. GSW … Scored 18 points with seven rebounds (four offensive) 1/12 vs. NOP … Totaled 18 points, seven assists and six rebounds 1/26 vs. DAL … Posted 25 points (4-6 3FG) and four rebounds 3/6 vs. GSW … Notched 24 points (five 3FGM) and five rebounds 3/8 vs. ORL … Totaled 22 points (8-13 FG) with five rebounds and two steals 3/22 vs. MEM … Scored 20 points (4-7 3FG) and grabbed four rebounds 3/25 vs. DEN … Notched 26 points with six rebounds 3/30 vs. MIA … Missed three games due to injury: Two with a sprained right ankle (12/11-12/12) and one due to a patella tendon strain (3/4). 2014-15: All-Rookie First Team honors ... Averaged 11.9 points, 3.2 rebounds, 3.5 assists, 0.86 steals and 0.20 blocks in 25.0 minutes over 59 games (38 starts) ... Logged 10+ points 33 times, including 20+ points 11 times and 30+ once … Recorded 10+ assists twice … Named Kia NBA Western Conference Rookie of the Month on 4/3 for games played in March, becoming the first-ever Lakers player to be honored with the award (first presented in 1981-82) ... Ranked among rookie league leaders in points (2nd/11.9), assists (3rd/3.5), FT% (3rd/.829), FG% (4th/.448) and rebounds (13th/3.2) ... Had two game-winning shots (FGM/FTM in last 10 seconds of 4th quarter or overtime) ... Named a starter for the final 38 games of the season, averaging a team-leading 15.8 points per game on 45.8% shooting to go with 5.0 assists, 4.2 rebounds, and 1.05 steals ... Posted eight points, four rebounds and two assists in NBA debut 10/28 vs. Houston … Recorded 11 points, three rebounds and four assists in first career start in hometown of San Antonio on 1/23 … Scored a career-high 30 points (career-best tying 12 FG) with seven assists, four rebounds and three blocks 3/24 at Oklahoma City … Became the first Laker to have at least 30p/7a/4r/3b in a game since Kobe Bryant did so 3/6/07 at Minnesota … Hit the gamewinning free throws with 0.3 seconds remaining in overtime 3/25 at Minnesota … Tallied 26 points, including the game-winning 3’ layup in overtime with 0.9 seconds remaining, 11 assists and six rebounds 3/30 at Philadelphia … Became the 5th rookie in Lakers history to record at least 25 points and 10 assists in a game, joining Jerry West, Elgin Baylor, Norm Nixon and Archie Clark … Over the last 13 games of the year, hit for 20+ points eight times, including one 30+ point outing … Missed one game due to a sprained left ankle (4/15) … DNP-CD 22 times ... NBA D-League: Played in five games on assignment with the Los Angeles D-Fenders, averaging 22.6 points, 7.8 assists and 5.0 rebounds in 36.0 minutes. 2013-14 Season: In his first season at Missouri after transferring from Tulsa, Clarkson was chosen second-team All-SEC by the league’s coaches and earned three league player-of-the-week honors, tops among SEC players. He finished seventh in the conference in scoring and assists and fourth in free-throw percentage. Father is Mike Clarkson, mother is Annette Davis and stepmother is Janie Clarkson ... Brother is Bear Clarkson, who plays collegiate basketball at Harris-Stowe State University ... 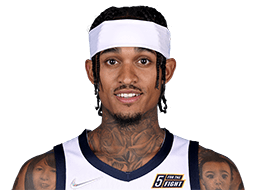 Graduated with a degree from Missouri in Arts & Science ... Was a three-year letter winner and a three-year starter at Karen Wagner High School ... Was named the San Antonio High School Player of the Year as a senior ... Had his No. 22 jersey retired at Karen Wagner High School on Feb. 13, 2015 ... Did not play organized basketball until 9th grade, focusing instead on competing in track and field in the 400-, 200- and 100-meter sprints ... Ranked as the state of Texas’ 4th-best prospect as selected by Texashoops.com ... Helped lead his Wagner High School team to a combined 105-14 record in three seasons ... Averaged 18.9 points, 6.1 rebounds 3.4 assists and 2.1 steals during his senior campaign while leading his team to a 38-2 record and semifinal loss in the state championship ... Soccer was his favorite sport as a child ... Heavily involved in Lakers charitable efforts in 2014-15, giving back through the Lakers Youth Foundation Casino Night, Season of Giving Holiday Party for Kids, Season of Giving Toys for Tots, Fit for Life Health Fair, Connect A Million Minds, Active Alliance Highway to Health Fair, Lakers Youth Foundation Golf Tournament, Camp Lakers and the Special Olympics Play Unified Game.